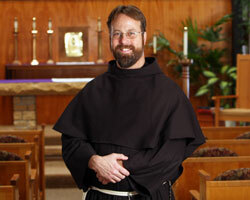 Conventual Franciscan Brother John Bamman credits St. Clare of Assisi for leading him to his religious vocation and formation for the priesthood. During a pilgrimage to Italy in 1996, Ann Doherty—who is a friend of his mother, Joanne Rizzardi—told him that St. Clare would “visit him in a special way” and have a profound influence on his life. At the time, he thought she meant that he would marry a woman named Claire. After a decade of discernment and a life-changing experience on her feast day, he realized that God was calling him to follow the way of St. Francis of Assisi and St. Clare as a Conventual Franciscan. Looking back on his childhood in Toledo, Ohio, at St. Joseph School, staffed by Franciscan sisters, and his teenage years at St. John’s Jesuit High School, Brother John laughed as he recalled how many times adults and teenage friends told him that he would be an excellent priest. “I think I first heard God’s call when I was in grade school,” he said. “I had this sense of being called to the priesthood. I got a lot of attention from being the class clown, and spent many days in [Franciscan] Sister Maria Goretti’s principal’s office. We are very good friends today. He earned a bachelor’s degree in natural resources, parks and recreation management at Ohio State University then moved west to Washington to work as an emergency medical technician for a search and rescue patrol at the Stevens Pass Ski Resort in the Cascade Mountains during the winter months and as a Catholic Youth Organization summer camp counselor, nature director then camp director for the Archdiocese of Seattle. He also studied theology “for fun” at Seattle University then got his commercial driver’s license and a summer job as a motor coach driver for a tour bus company in the Pacific Northwest and Alaska. His employment contract stated that a driver who ran out of fuel on a tour bus filled with people could be fired. One rainy August day, he miscalculated his mileage and ran out of fuel on a busy highway near the end of a 28-day bus tour. A man driving a pickup truck soon stopped to help. The Good Samaritan was a diesel mechanic, had a 50-gallon drum of diesel fuel in his pickup, and knew how to prime the engine to restart the bus. Thankful for his amazing luck, he drove to a gas station and asked the tourists from Ohio—his home state—to debark for refueling. They missed a boat tour of Puget Sound, but didn’t mind because it was raining. He received a two-month suspension from his job, and decided to go on a mission trip to Lima, Peru, that changed his life. During the trip, his brother, Brian Bamman, told him that he had run out of fuel on Aug. 11, St. Clare’s feast day. Ann Doherty’s prediction had come true, and that inspired him to visit religious communities at age 34. He was drawn to the Conventual Franciscans, who have retreat ministries at Mount St. Francis Retreat Center in southern Indiana, Prior Lake in Minnesota and Mesilla Park in New Mexico. The friars also staff the Basilica of the National Shrine of Our Lady of Consolation in Carey, Ohio, where countless people have been cured of illnesses and physical infirmities then left their wheelchairs, braces or crutches. He had visited the shrine for a Teens Encounter Christ retreat when he was a junior in high school, and again felt drawn to the Franciscans’ spirituality and love for nature as an adult. At the age of 41, he felt his life “coming full circle” on Aug. 8, 2008—the day he refers to as “08-08-08, a day of crazy eights”—when he answered God’s call and professed his solemn vows as a Conventual Franciscan at the basilica. During his formation, Brother John studied Spanish with friars in Costa Rica and took a sabbatical to spend time with his parents, Bill and Joanne Bamman, when his father was dying. He completed his novitiate at St. Francis Friary in Mishawaka, Ind., and has helped with youth retreats at Mount St. Francis. He lives at St. Joseph Cupertino Friary in Prior Lake and is finishing his final year of theology studies at St. Paul Seminary at the University of St. Thomas in St. Paul, Minn., in preparation for his ordination as a transitional deacon in 2009 and his ordination to the priesthood in 2010.